The third installment in the acclaimed series of adventure games developed by Daedalic Entertainment focusing on the adventures of Rufus who comes from Deponia, the planet of trash. Goodbye Deponia for PC, PS4 and XONE is the third and the last installment in the series of classic adventure games, Deponia, developed by a German studio - Daedalic Entertainment. The story focuses on Deponia - a planet, which was recently sentenced to doom by a council residing in the flying city of Elysium. The game's protagonist, Rufus, along with his beloved one, are trying to reach the floating metropolis in an attempt to save their homeworld. Previously, Goal temporarily suffered from a split personality disorder; this time around, it is Rufus who posesses multiple personas. While it may, theoretically, make completing their mission easier, it should be common knowledge by now that he has a unique talent for getting into all kinds of trouble. Goodbye Deponia brings a conclusion to their adventures and portrays Rufus in somewhat different light. Up to this point, he was depicted as a cynical, and certainly not the most sympathetic, character, but now, in the final installment of the series, the protagonist begins to question his behavior, and we get to know his other side. The gameplay mechanics employ a point ‘n click interface and somewhat cartoonish, hand-drawn 2D visuals. Goodbye Deponia for PC, PS4 and XONE is a classic adventure game, in which we solve puzzles and immerse ourselves in the game’s setting. Unusual characters and tons of humor are a trademark of this series. 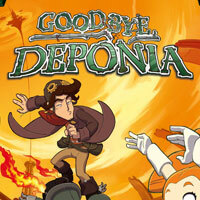 Goodbye Deponia Guide is a complete, fully detailed walkthrough and guidance, thanks to which you can easily solve the problems encountered along the way and deal with even the most difficult puzzles and riddles.